1. A set of lil' snack bowls in the perfect range of pastels that your cupboard is practically begging you to buy. Seriously, it's ~hungry~ for something as cute as these! Get a set of six from Anthropologie for $36. 2. Mint green pot holders and oven mitts that'll *heat up* your kitchen with some serious charm. It's just such a lovely, soothing color and shouldn't a kitchen always feel like that? Get a set of three pot holders from Amazon for $6.65 (available in 22 colors) and a matching set of two oven mitts for $11.99 (22 colors). 3. A multi-colored knife set – assign each one for meats, produce, breads, etc., while adding a bit of sweet color to your kitchen. Ok, most of these are pastel-colored — but regardless, they're still purty as heck. Get the sets of six knives from Amazon for $21.51 or Macy's for $49.99. 4. A sleek, cream-colored toaster that's honestly so gorgeous, you'll *want* it out on your counter for all your guests to admire. Get it from Amazon for $42.99 (also available in turquoise). 5. A nine-piece silicone utensil set – WHO GAVE THESE THE RIGHT?! These give my current set (and, really, my entire kitchen) a run for its dang money. The set includes a soup ladle, serving spoon, slotted spoon, pasta server, splotted turner, spatula, basting brush, whisk, and tong. 6. 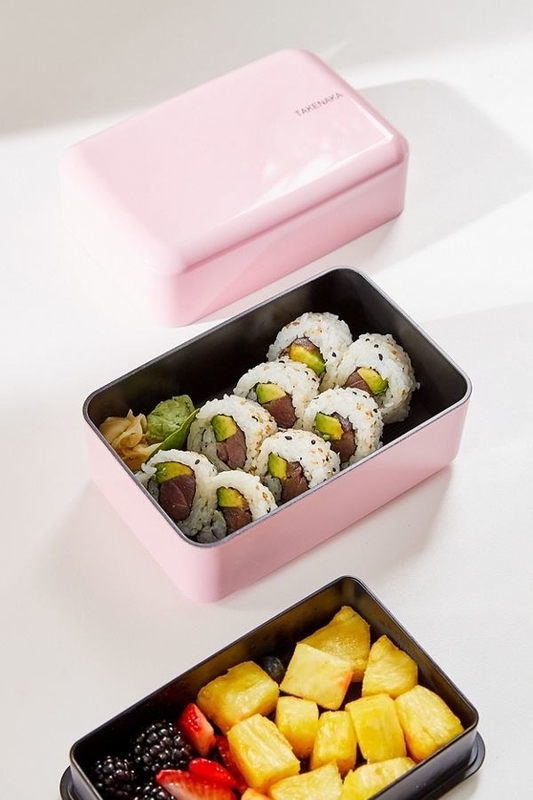 A fabulous little bento box so stylish, you won't hesitate packing a lunch. 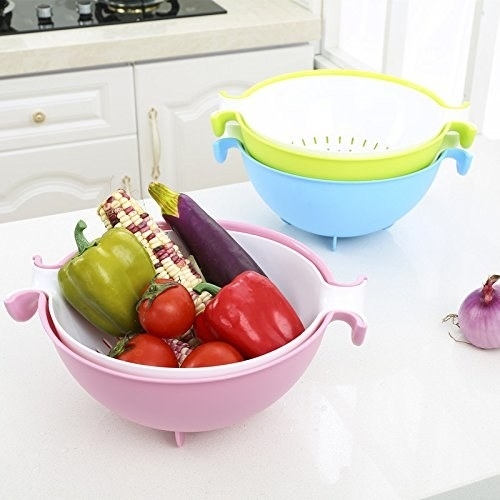 This set comes with a divider to separate foods and an elastic band to hold it all together. It's dishwasher and microwave safe (without the inner lid). Get it from Urban Outfitters for $29 (available in three colors), or something similar from Amazon for $9.99+. 7. A 16-piece dinnerware set with a subtle blue brushstroke detailing that belongs in your kitchen! One more time for the people in the back, 🗣 you need these dishes! Comes with four sets of dinner plates, salad plates, bowls, and mugs that are dishwasher and microwave safe. Get it from Walmart for $39.99 (available in three colors). 8. 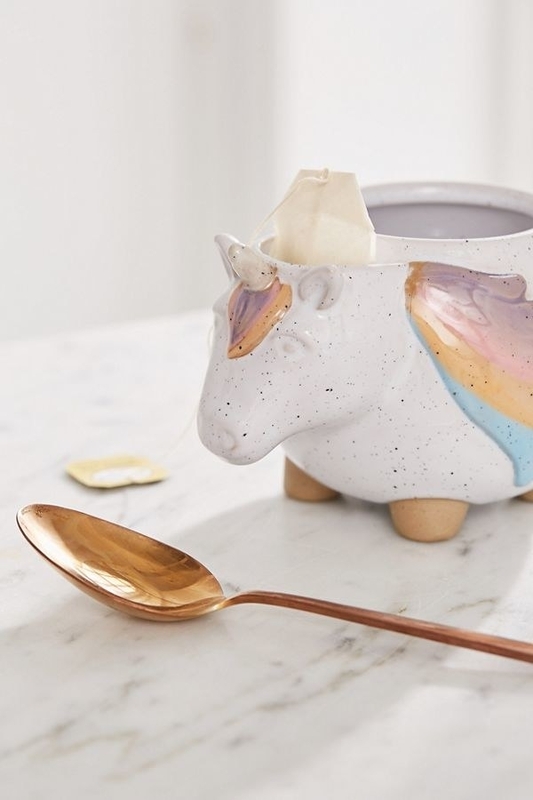 A set of stoneware measuring cups guaranteed to make you feel like you're Sleeping Beauty's godmothers, just livin' in a precious cottage and whipping up blue — no, pink! no, blue! — cakes. Oh, and they're dishwasher and microwave safe! Get a set of four from Amazon for $15.48. 9. An eco-conscious sandwich bag that's dishwasher and microwave safe, and made from food-grade silicone that's free from nasty chemicals. It's also really cute, so, do with that what you will. Get the sandwich bags from Anthropologie for $12 (available in five colors) and the lil' snack bags for $10, or from Amazon for $11.99+. 10. 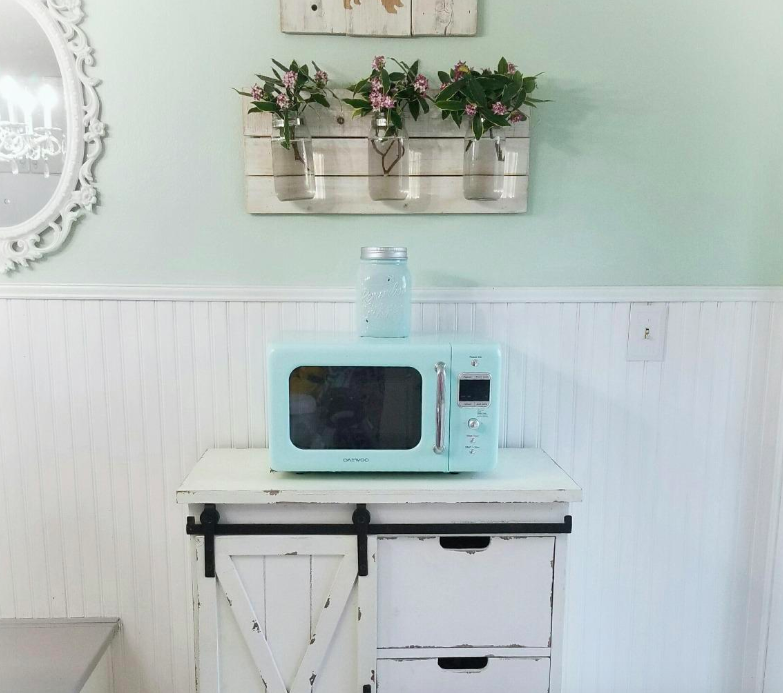 A teensy retro-style microwave perfect for compact spaces — and I don't think my heart (or wallet) can make it through the rest of this post!!! 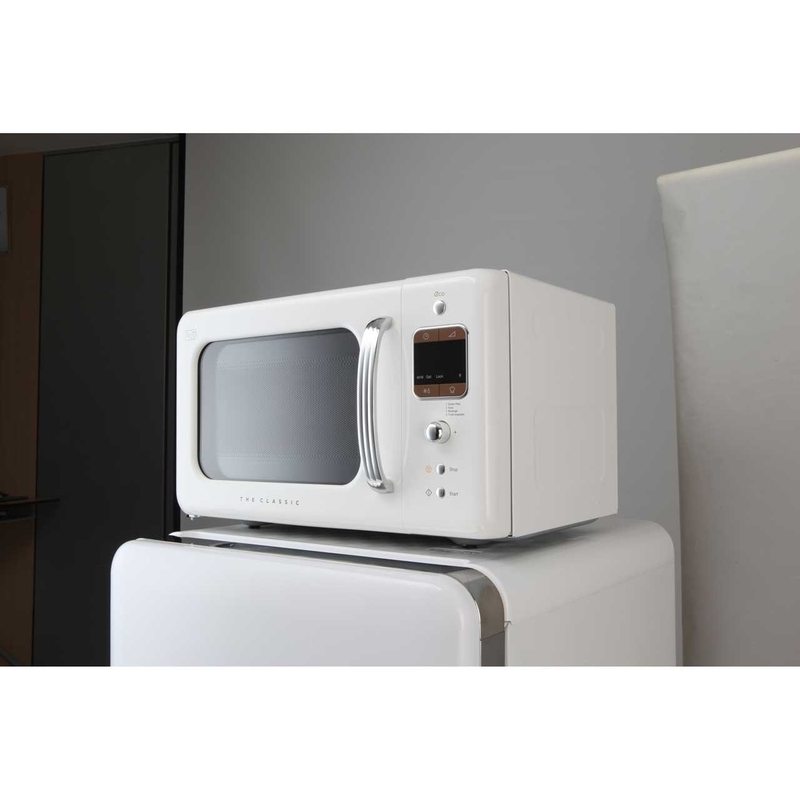 Promising review: "Super cute microwave that fits inside the space that we need. It seems to heat things really well (faster than the bigger microwave that we used to have) and the defrost function really seems to defrost quickly, evenly, and without pre-cooking the food. I really like the knob that you spin to set the time (so cute! ), and the 30-second push button is perfect for quickly adding time. I thought we might feel annoyed about having to turn the microwave ON each time we used it, but it's really not an issue." —Jamie D.
Get it from Amazon for $69.99+ (available in five colors). 11. A ceramic utensil jar your wooden spoons and spatulas will flip for. Seriously, your regular flatware will be green (correction: mint green) with envy after seeing this. 12. A bread box to keep your loaves and pastries from turning into crumbly rocks so you actually have a chance to eat them. Protect carbs at all costs! This box has ventilation holes built in in the back so there's still circulation, so your bread will stay even fresher! 13. A set of salt and pepper grinders that are enough reason to throw a dinner party. Really, these are too pretty to not show off to every human on this planet. 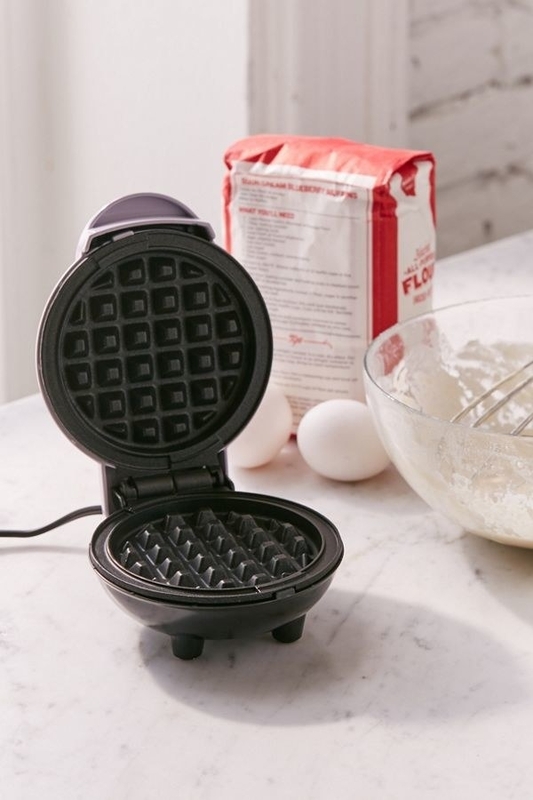 Get them from Food52 for $75. 14. An egg cooker (in a dreamy mint color) for cooking up the *perfect* boiled egg in under 10 minutes. This handy gadget ensures you never again have to Google, how do you boil an egg? You seriously just walk away and let this do its thing! I've actually used this before and originally thought it was silly. But after testing it out, it was truly a relief to not worry about time. All I had to do was prick holes in the tops of the eggs, fill it with water, and turn it on. It comes with helpful instructions, so once you do it, you're pretty much set. It's a great little purchase for anyone who loves to eat eggs! Get it from Amazon for $16.99+ (available in five colors). 15. Mason jar measuring spoons because something as darling as these ~kneads~ to be in your cookware collection. Get them from Amazon for $11.46. 16. A pair of pretty in pink meat claws for shredding brisket, pork, chicken, and whatever other meat you can dream up, with complete ease. 17. A space-friendly, countertop kettle to quickly boil water for all your hot-water needs. And with this pistachio-green color, you'd be nuts not to buy it. Get it from Crate & Barrel for $79.99 or Amazon for $68.99 (available in six colors). 18. A set of ceramic non-stick cookware because nothing screams adult-life more than matching pots and pans. Also, I can't get over this cream color, so there's that. Get a 10-piece set on sale from BuzzFeed's Goodful line, exclusively at Macy's for $149.99 (originally $214.99). 19. A vintage-style cookie jar so you have even MORE of a reason to constantly bake fresh cookies. 20. 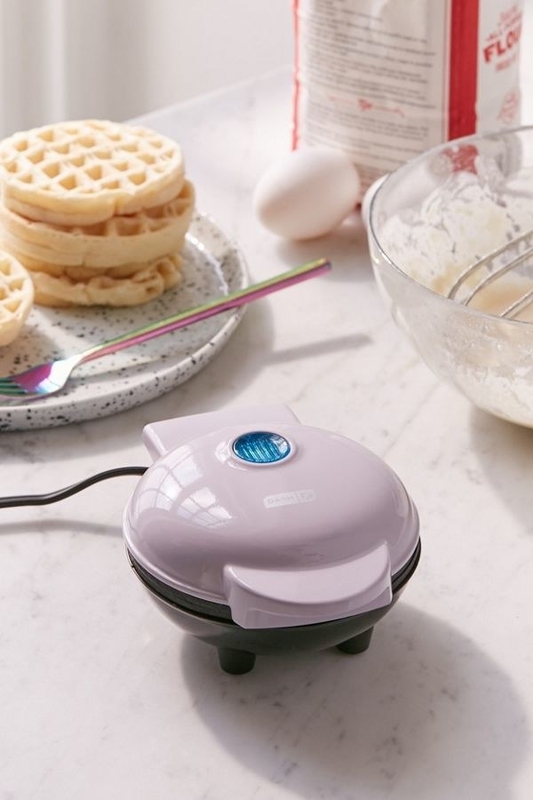 A mini waffle maker that'll serve two very important jobs in your life: to make bb waffles and be the cutest gadget in all the land. Get it from Urban Outfitters for $18 (available in three colors), or eight different colors from Amazon for $9.99. 21. A copper-coated stainless steel gadget set with soft pink handles you have to make room in your drawers for. I mean, the copper and the pink! It's too much beauty for my eyes to take. The set comes with a pizza cutter, garlic press, peeler, whisk, ice cream scooper, cheese grater, and can opener. Get it from Amazon for $31.99 (available in six colors). 22. A KitchenAid mixer because the time has come to splurge on this workhorse. The only tough part will be selecting the perfect color because this beauty comes in tons of soothing pastels. Get it from Amazon for $279.99+ (available in 55 colors). Each tumbler has a 12-oz. capacity and is dishwasher and microwave safe. 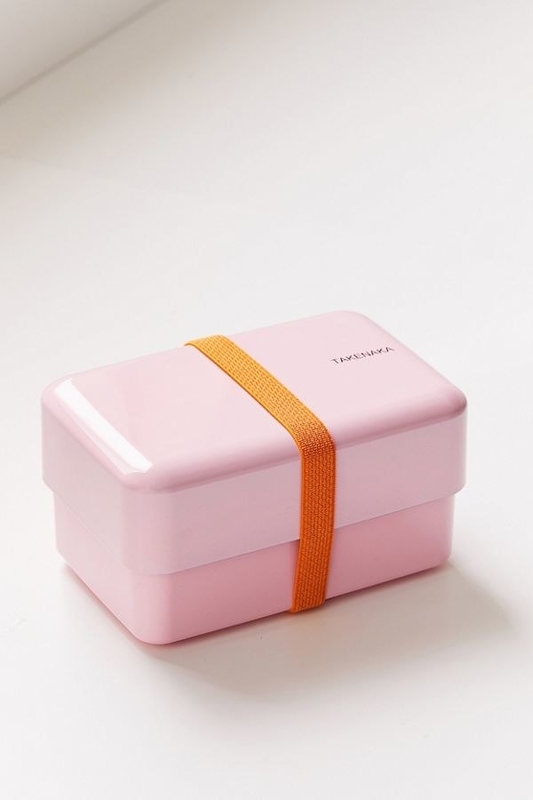 Get it from Anthropologie for $32 (available in five pastel colors). 24. A stoneware teapot that'll make you want to throw all the tea parties just because darn well you can! Get it from Amazon for $17.95 (available in 10 colors). 25. 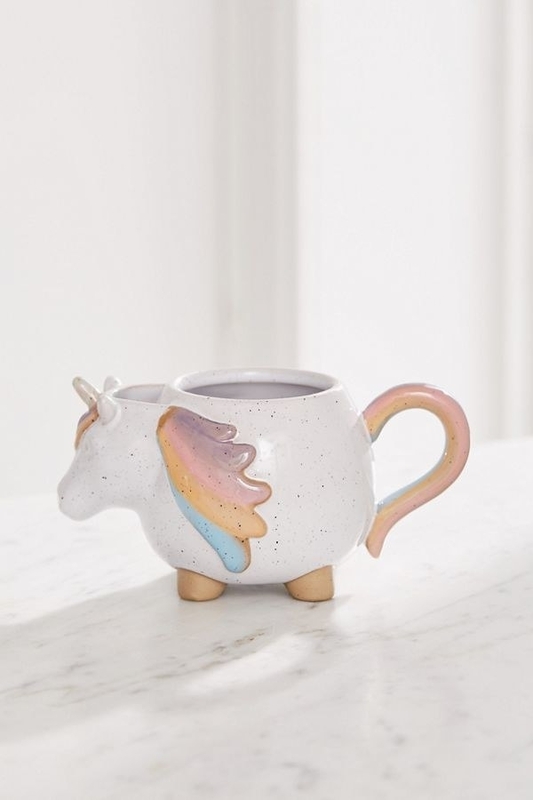 A whimsical unicorn tea mug for the days when you just need some more magic in your mornings — and I think we could *ALL* use more of that. It features a tiny compartment perfect your tea bag once you're finished brewing! 26. A set of ceramic canisters with teensy spoons so your coffee, sugar, and flour have the most stylish home. These are so adorable, you should absolutely leave them out in your kitchen. Get a set of four from Amazon for $29.99+ (available in four colors). 27. 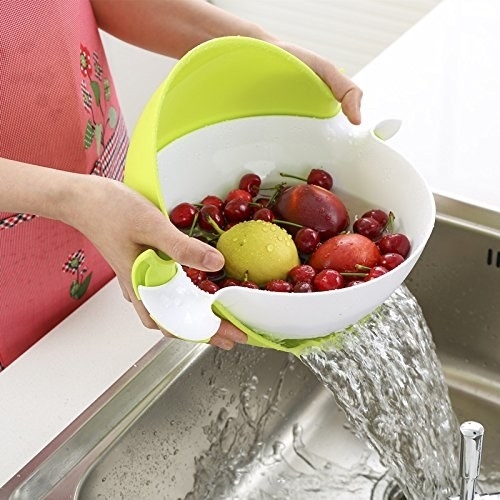 A two-in-one strainer and bowl that'll make it even easier to wash fruit, drain pasta, and save your food from falling down the drain. Get it from Amazon for $8.59 (available in two colors).